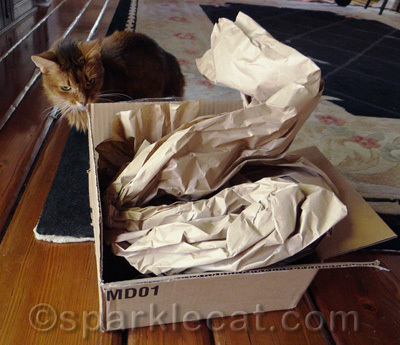 You are here: Home / Diary / Halo Healthsome Cat Treats and How to Review Them! 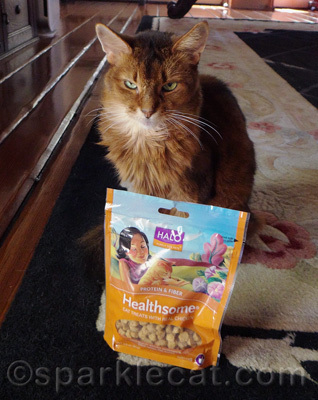 Halo Healthsome Cat Treats and How to Review Them! Unless you have “Liked” my Facebook page, you missed the Big Treat Disaster of 2013: a swarm of ants got into the cabinet where our treats are stored and my human wound up having to throw out five whole bags! It was an awful tragedy, but all was not lost because just a day later, this box arrived in the mail! 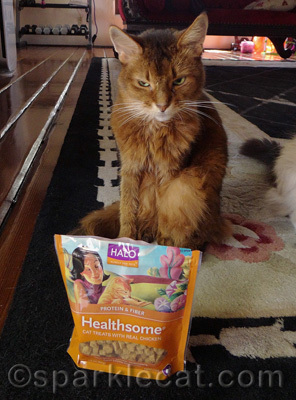 It was from Chewy.com and they sent me some Halo Healthsome cat treats to review! In addition to the badly-needed treats, the box also contained Chewy.com’s special crinkly packing paper — always a fun extra for us kitties! 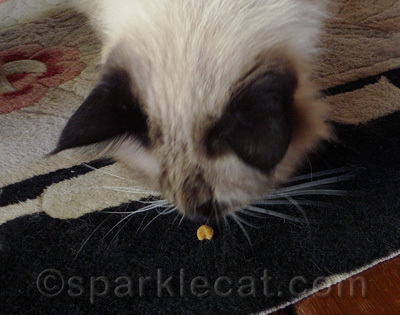 I know many of you blogging kitties out there get to review treats too, and this particular photo session reminded me that there are some rules that should be followed… because my human did not follow them this time! 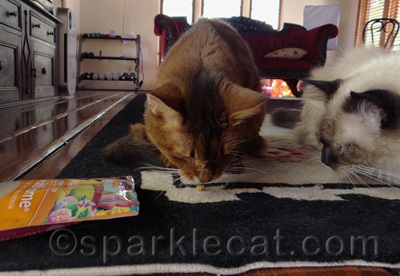 Here is the first rule: kitties don’t like to pose with treat bags that are not opened yet. The next rule: kitties don’t like to pose with opened bags of treats either, unless the human is in the act of actually pouring some out! Finally, I decided to just help myself. I got the cat treats with real chicken, which is cool because chicken is my favorite flavor! They are quite tasty, and they have fiber which, to be honest, I kind of need. While there are a lot of ingredients that probably shouldn’t make up the bulk of a cat’s diet (potato flour, tapioca flour and several veggies), there was also no corn, wheat, added sugar or other bad things — and, well, treats shouldn’t make up the bulk of a kitty’s diet anyhow. Best part: chicken was listed right at the beginning of the ingredients list! Yes, I knew Boodie was sitting there, salivating! Her patience was eventually rewarded. My human had to lock up Binga while we were taste testing, otherwise Boodie and I would never have gotten any! But she got some later and we all loved these treats. So count that as 12 paws up for the Halo Healthsome treats! You can find more Halo food and treats here. And if you haven’t yet, you might want to enter Chewy.com’s Faces of Summer giveaway! You just need to post a photo of your cat (or dog) enjoying what’s left of summer, with a short description, to Twitter or Instagram with the hashtag #teamchewy, or send it in a message to the Chewy.com Facebook page. 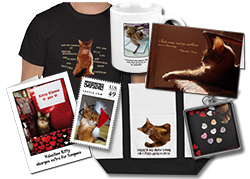 You will be entered into the raffle for a special Chewy.com Prize package, and also get a chance to be a featured pet. The contest ends September 30, and the winner will be contacted the first week in September. There are also more ways to enter and win in the Chewy.com monthly contest with Rafflecopter widget below — the deadline for these entries is August 31. I do NOT like unopened treat bags either!! Unopened treat bags is basically cat abuse!!! Someday, somebody somewhere will invent a treat I will actually eat. But I will never know it because after having spent $4,363,287 on treats for me which ALL — every single one–ended up in the garbage or (usually) in the mouths and tummies of her friends’ cats, she has Officially Given Up and will never again buy me a treat. Teasing you with a closed package of treats is never a good idea. We are imagining a Binga-shaped hole in a door when she heard you eating treats and wasn’t getting any. 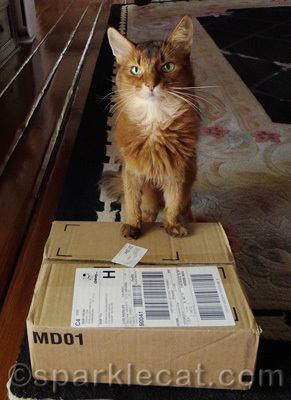 Looks like you all enjoyed the treats….after your human finally opened the package. Sorry about that ant disaster. 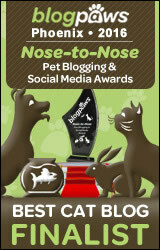 When I won the Nose To Nose Award last year, I got those treats and hated them so I won’t enter. I don’t think Chewy likes me cos I seem to be the only blogger who he won’t work with. They emailed me once and was supposed to send me something which never arrived. AAAiiiiiieeeeee! We never heard the ant story!! How horrid! These sound positively nommy and worth a try! Those treats look and sound very tasty. Sparkle that is a pawsome review and it sounds like a 5 paw review too. Great review! When will our humans learn that opened bags of treats are needed for reviews! 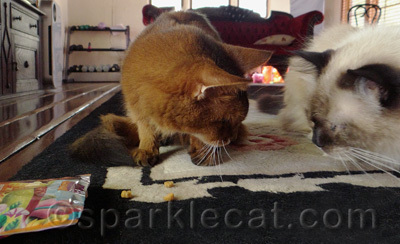 Sparkle, we are requiring our Mommy to take note on the Treating Taste Test Procedure–she ALWAYS messes up the posing part, too! …sparkle…tell yur mom ta put powder in de pan tree…doesn’t hafta bee any thing eggs spensive; if ewe haza dollar tree store out ther; get sum frum them… N put de powder round de base boards and inta any kinda “loose space”…itz not harm full ta catz, ants can KNOT pass thru it N de treets be saved 😛 hope everee one haza grate week oh end ! Oh no Sparkle I missed the post about your treats. How awful. So glad you got new ones. Thank you for the awesome giveaway. The only good treat bag is one we empty Sparkle!!! Was Binga throwing herself at the door? We get the impression she wouldn’t take being locked up without a protest! Great review, Sparkle. 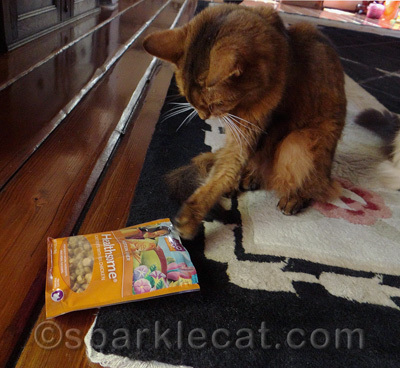 Sparkle, we got a bag of those treats to try and do a review, too. We’ll make sure we follow your tips when we do it. We love those treats too! You did a perfect job, Sparkle! Thank goodness your Mom gave you all some treats to try otherwise there could have been pawdicuffs. They look and sound great! Those do sound like terrific treats. Nice an healthy. Glad the Mom finally started to pass them out. Take care. Sounds yummy! We were wondering where Binga was … She’s such a photo hog! Happy Furday! Ooooo those sure do look om-nommy! We do not like unopened treat bags either! !